Chemistry is governed by a definite set of rules. Opposite charges attract, like dissolves like, matter is always conserved. There are more rules than just those, but one of the great things about the study of matter and its interactions is that if one truly understands the rules and laws governing chemicals, he can predict outcomes given a set of preconditions. In that sense, Sokobond has even more in common with chemistry than it lets on. Though it boasts that no chemistry knowledge is required to play, it too runs on a specific set of rules, and any player who internalizes those rules can find success in-game. As a fortunate side effect, any who spend time connecting atoms in Sokobond might just learn something about chemistry too. In Sokobond, the rules are simple. Atoms are distributed on small square grid arenas, and the player is given control of one. Each element has a set number of bonding electrons: carbon has four, nitrogen has three, oxygen has two, and hydrogen has one. If any two atoms with free bonding electrons are moved adjacent to one another, and bond is formed between those atoms, and they move as a single molecule from then on. Students of organic chemistry or biology might recognize those four atoms; they are the major atomic components of organic molecules. In Sokobond, those elements behave as they would in the real world, with each forming as many bonds as it has bonding electrons. Though the above description might turn off those who are less scientifically-minded, the game is much more inviting. All a novice needs to know is that two atoms with at least one dot each floating around them will spend those dots to connect together, and the goal is to use all the dots. Although Sokobond begins with a simple premise, it is quite difficult toward the end. Some solutions come easier than others, but all require use of logic and forward thinking. If I had to have one complaint about Sokobond, it would be that I may never see it to completion due to the demanding difficulty of the later levels. In that regard, the game parallels the actual study of chemistry more than it admits to. Though anybody can play, it would be untrue to suggest that a background in chemistry does not help a little. Though each puzzle can be solved without knowing the destination molecule beforehand, having that knowledge can help to provide direction on the more complex problems. 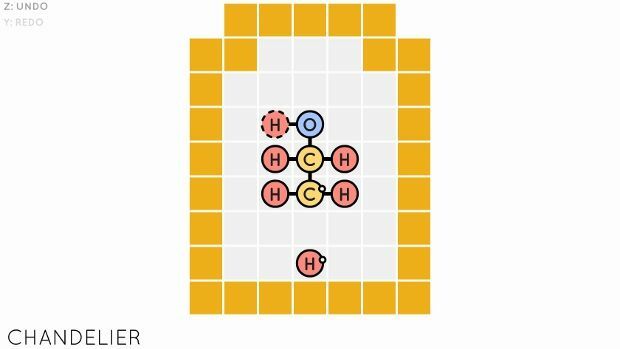 For instance, one of the later puzzles requires the molecule to have a ring structure, and while it is possible to figure that out without prior knowledge, it comes more quickly to those who could recognize the need from the combination of elements in play. On the other hand, a background in chemistry hinders in other cases. Specifically, small molecules typically have set shapes and are drawn in certain ways, but those restrictions are not put in place in Sokobond. Occasionally, I knew what the target molecule was, but could not come to the solution because I was also trying to match it to my preconception of the molecule's shape. Otherwise, Sokobond remains firmly grounded in reality. 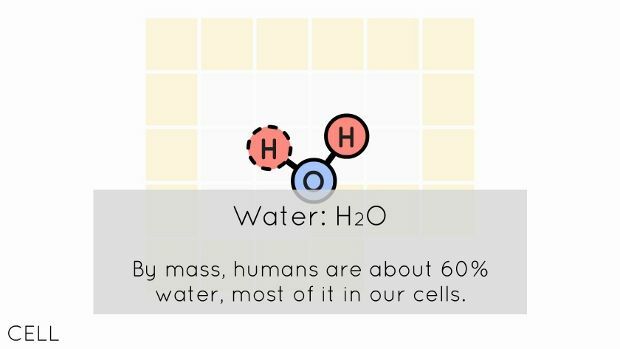 Every molecule created is one that at least could theoretically exist for a measurable period of time, and most are common molecules that we interact with every day. 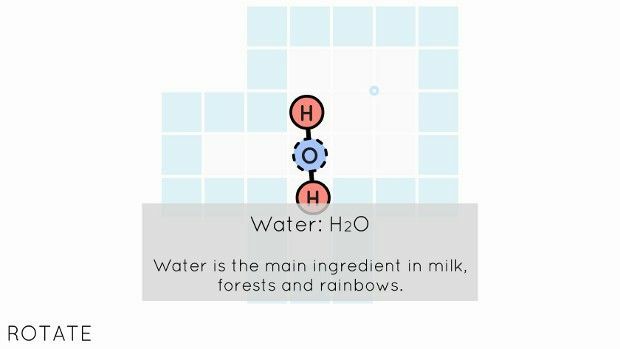 A nice touch is the reward for completing a given puzzle: the name of the molecule created and some interesting factoid about it. Like most great puzzle games, Sokobond does introduce new mechanics as the game progresses. After learning the basics of moving atoms and bonding them together, objects are introduced that will cleave bonds, increase the bond order of a bond (create double, triple, or quadruple bonds), and rearrange molecules. Helium is introduced as a fifth element to play with, and it exhibits its status as a noble gas: never bonding but still useful for other functions. As the player progresses through the levels, new sections in the level select screen open up. 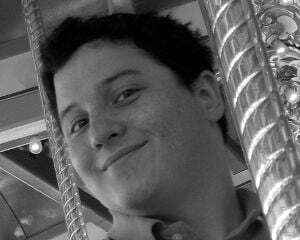 Progression is nonlinear, but certain areas will only open up after completing particular levels. For instance, after completing a certain level in the group highlighting bond order and one in the group focusing on bond cleavage, a group opens up that combines the two. By the end, another Easter egg for chemistry nerds reveals itself: the level select screen takes on the silhouette of the Periodic Table of Elements. Mirroring the simplicity of the gameplay is a minimalist aesthetic in both art and sound direction. Solid colors and sharp lines are used to convey all the necessary information. Each bond formed adds a single tone to the overarching atmospheric background drone. Though Sokobond is not focused on creating music, each level allows the player to create a fleeting, custom Enoesque soundtrack depending on which bonds are formed, in which order, and with what timing. In a word, Sokobond is elegant. It is elegant in its concept, it is elegant in its aesthetic direction, and it is elegant in its puzzle design. It starts out using only a few simple rules, builds on those, and eventually combines it all to become quite challenging. Science enthusiasts and laypeople can learn it and enjoy it. Even though chemistry education is not the primary goal, anybody who plays will come away with a slightly better understanding of chemical bonds, or at the very least a few neat pieces of trivia about molecules.